Russian and East European supermarket in Leyton. 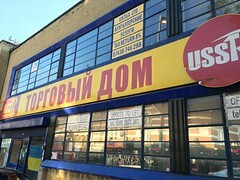 Its name in Russian is USSR Торговый Дом, and it has another branch in Hounslow. secretlondon visited in September 2015 with Russian and Polish friends. The supermarket is large and has a lot of chilled meat products, things in jars etc. Most of the labels seemed to be in Cyrillic. One thing to note is that there was a lot of duplication. In some places they had lots of one type of a particular item where you would normally expect multiple items. For example a particular type of Russian lemonade filled a large part of one of the aisles, and some fridges seemed empty. I bought some Lithuanian dark rye bread (made in the UK) which was nice and some non-alcoholic kvass. They had no beer, sadly, but had spirits. I was told that some of their brands are 'knock offs', products that are designed to look nearly like a well-known brand, but not quite. This is something that would be hard for a visitor to pick up. Last visited by secretlondon, September 2015. Opening hours taken from the USSR Ltd website, September 2015. Last edited 2016-05-27 07:41:02 (version 4; diff). List all versions. Page last edited 2016-05-27 07:41:02 (version 4).